Exciting news, friends! I have been invited to be Guest Designer for Canadian Scrapbooker magazine! This is a one year term, starting with the Winter issue, which will be released December 1. My photo and Bio is now posted on their Home webpage…so if you want to check it out, click HERE. Quite a few of the projects I will have on my blog will also be featured in the magazine. I am thrilled and honoured to be a part of the fantastic team behind the magazine…they are a very talented group of scrapbookers! 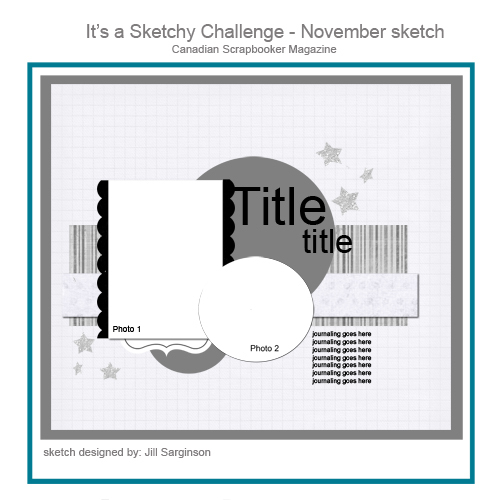 Today I am sharing a layout I completed for the monthly staff challenge at Urban Scrapbook, the store where I teach and design….plus, I used Jill Sarginson‘s sketch from the November Sketchy challenge over at the Canadian Scrapbooker website. Here is Jill’s awesome sketch…. 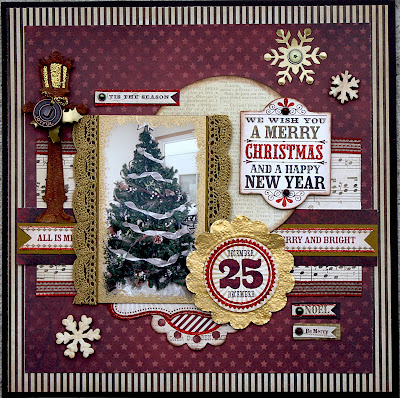 The designer at Urban who creates these monthly staff challenges is Jan Hobbins…a truly gifted artist when it comes to scrapbooking and crafting. In our kit with these papers, she included the following which we were supposed to alter in some way: a chipboard lamp post, 2 wood snowflakes, another snowflake and holly cut from acetate, and gold metal paper. I coloured the chipboard lamp post with Vintage Photo Distress Stain and Clear Rock Candy Crackle Distress paint. Then I added a light behind the top lamp part by tracing it onto gold cardstock. I attached this gold cardstock piece behind the lamp with Glossy Accents. It dries quickly and is great for adhering chipboard, grunge board etc. 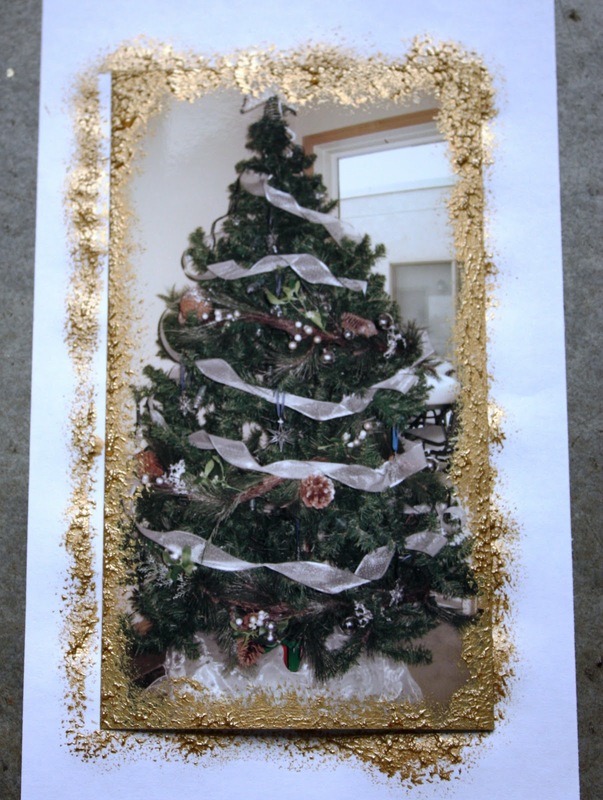 The lamp wasn’t shining brightly enough so I added some Gold Stickles right onto the gold cardstock. 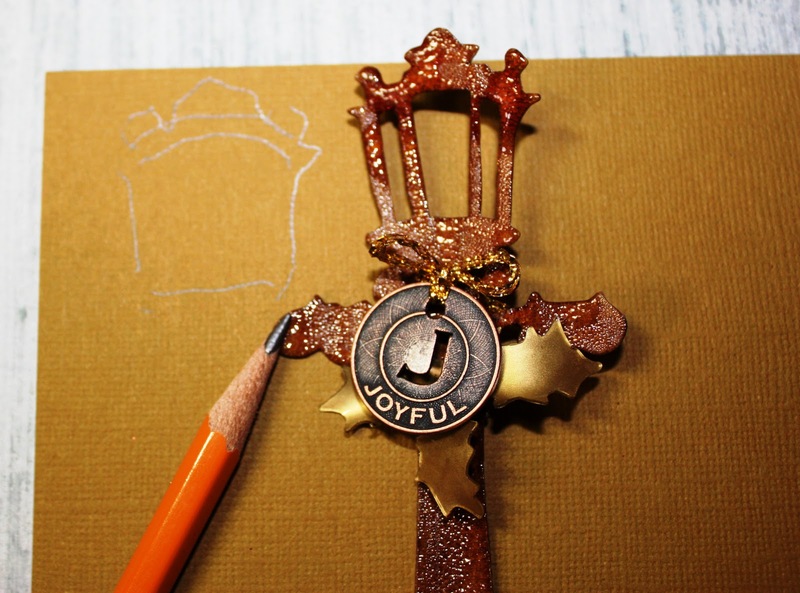 The acetate holly you see on the lamp post is simply altered into a gold element using Gold Mixative Alcohol Ink. It dries immediately and gives beautiful coverage on non-porous elements like plastic and transparencies. I did the same with the clear acetate snowflake.. 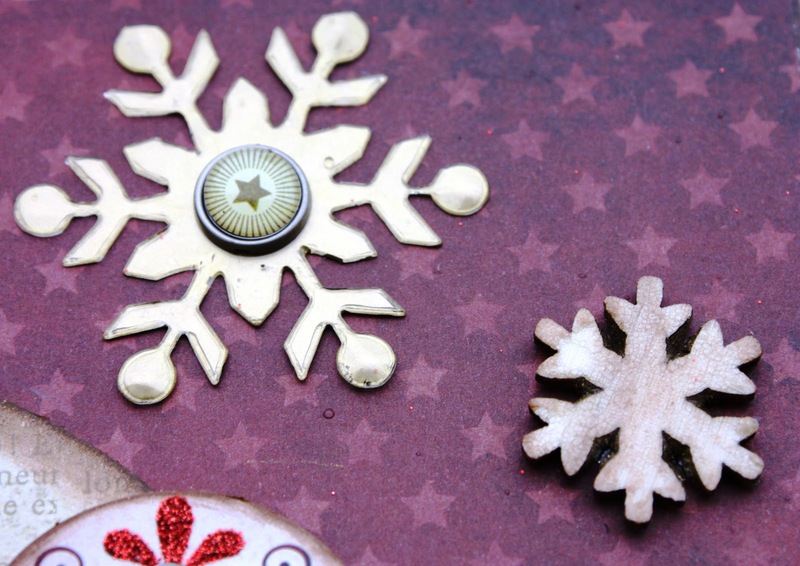 The snowflake on the left has the Gold Mixative on the back…hard to tell in this photo. The wood snowflakes from Maya road were altered with Clear Rock Candy Distress Crackle paint and then to highlight the “cracks”, I rubbed on some beautiful Accent Powder by Harmonie…. 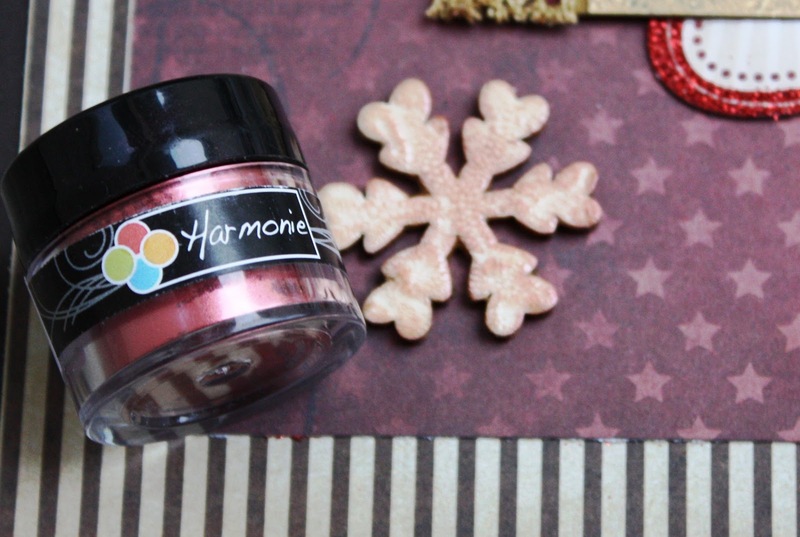 The cracks just come to life with this Raspberry Accent Powder. 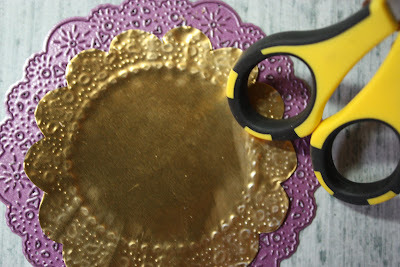 To alter gold metal paper from Spellbinders, I used a die cut scalloped element from the MME Christmas collection and traced it to make a whole scalloped circle. 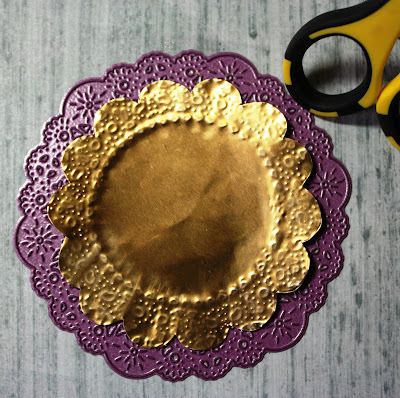 I used the rubber handle of my Cutterbee scissors to rub the metal paper on the doily die and emboss it with the design. 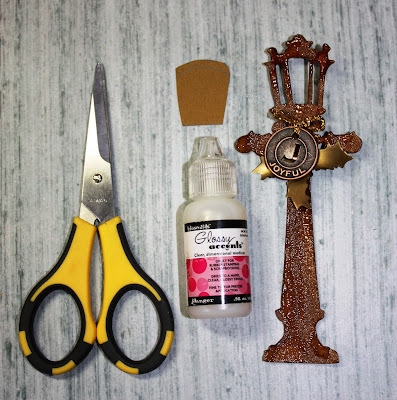 This wasn’t my official plan…I just didn’t clean up my workspace and the doily die was sitting there ….so the lightbulb went on over my head while I was looking at my metal paper! lol! And here’s the finished metal doily! 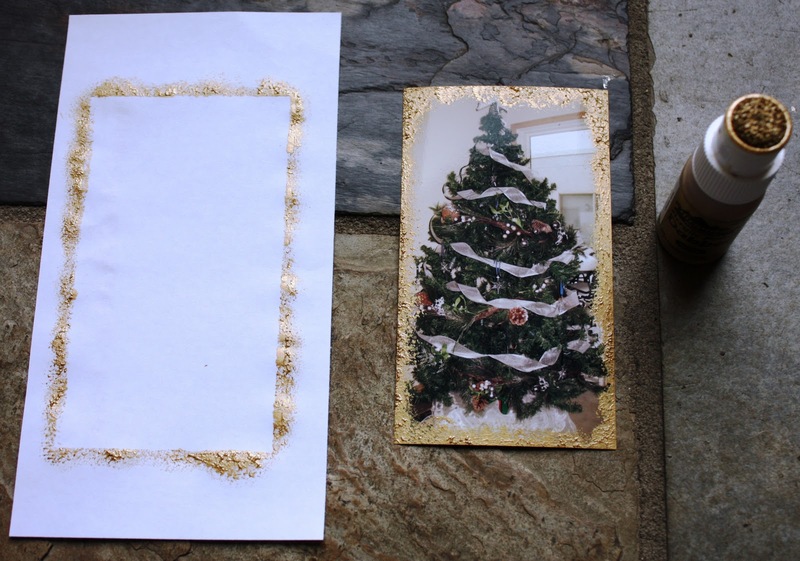 Place your photo on a piece of scrap paper and use any paint dabber. 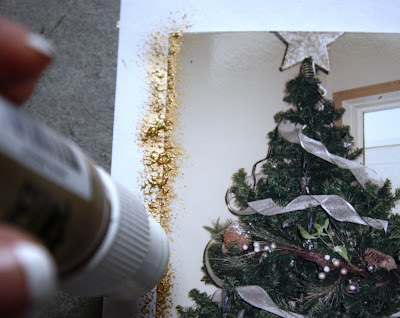 Pounce or bounce your paint dabber along the edge of your photo to create a soft stippled effect. I didn’t let this dry on the scrap piece…I took it off so it didn’t stick to the paper. 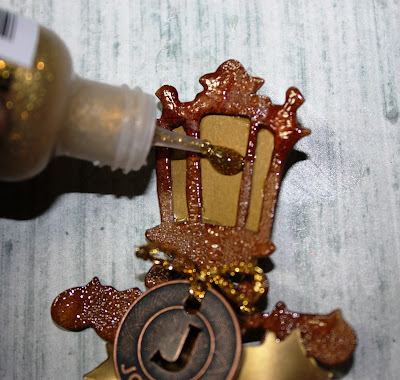 So easy…and it dries within minutes. Put it all together….and it’s a Very Merry Christmas! The tree in the photo is very special to me, not because it is the first artificial tree we bought together when married, but it is now decorated with beautiful Swarovski crystal snowflake ornaments. One design is released every Christmas, and a few years ago I told my husband how my BFF had been collecting them since the year of her daughter’s birth. I wished I had done that. So for the past two Christmases, he had purchased all of the snowflake ornaments designed since the year of our son’s birth, 1995, and gave them all to me 🙂 I was moved beyond belief…he’s a wonderful man and I’m so lucky. These Christmas projects have brought me much joy and helped me appreciate the spirit of the season….. So it’s time for another GIVEAWAY!!!! Kelly CONGRATS!! That is awesome news about being asked to be a GDT by Canadian Scrapbooker..so happy for you:) And what a gorgeous LO you’ve created, lovin’ your tutorials…hmmm might have to give making tutorials a try! Cheers! Congrats & what a fabulous X-mas page! 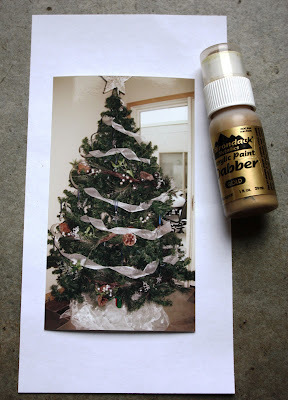 I can’t believe we’re already upon yet another X-mas…but that’s ok…this page inspired me to dust off all of my X-masy stash! Beautiful work & thanks for sharing some of your tips! I rhink your page is fabulous! I’m so happy you showed us more details of of the lamp post, snowflake and doily. I would not have realized it was your alterations. Bravo! Great post! I love the lamp post it turned out so great!! I also like the spellbinders die. It looks like a must have for sure! Thanks for sharing. Incredible page! I absolutely love that lamp post…thanks for showing us the alterations! Such exciting news!!! Super Congratulations!!!! 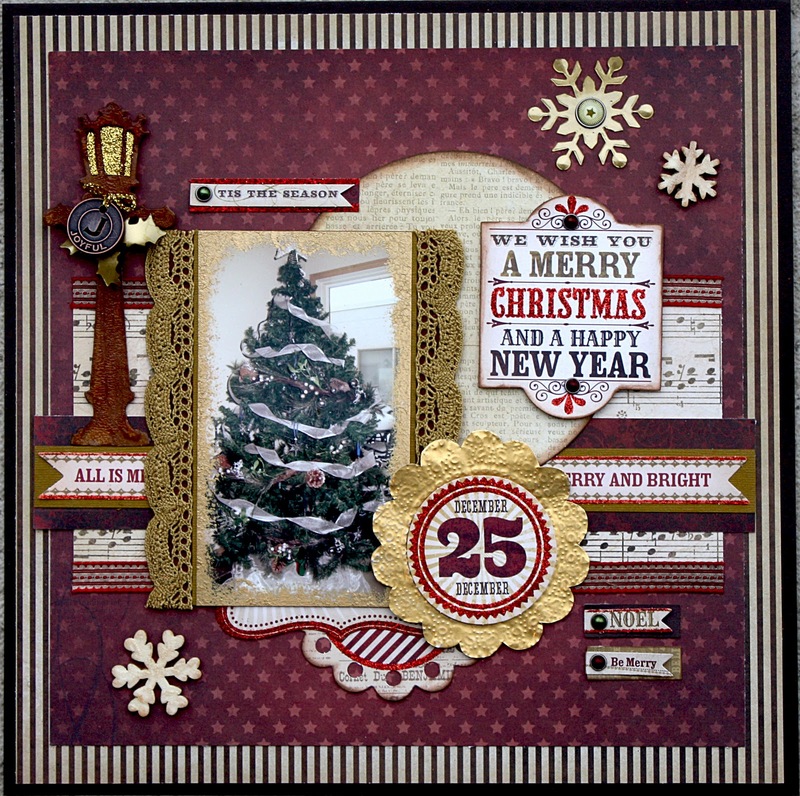 and what an amazing layout….love the look of the dabbed paint along the photos edge…and your altered chipboard pieces are amazing!!!! just gorgeous!!!! Such great exciting news for you! Congrats! I’m looking forward to seeing the layouts you’ll be creating in the magazine! I really love this Christmas Lo you did! Fantastic! Beautiful layout and fantastic tutorial!! 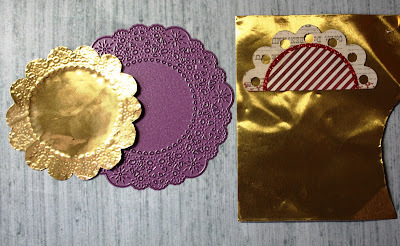 I love the embossing from the die idea!!! So many layers of interest in that design!! Love it!!! Thanks!!!! Congratulations Kelly! It is well deserved! Your projects are always inspiring and amazing. wow, Kelly-congrats on the designer spot; I think canadian scrapbooker is by far the best scrappping mag out there!Your Lo is fabulous! I just love the lamp post, such a simple way to make it look so shiny! and the edging around the photo, nice! Thank you for the great step by step explinations! Wow, Kelly…..I am really glad that I stopped by here to look at this LO again…..you really used a lot of techniques that I somehow missed at SB.com….gee, whiz! You ROCK, girlfriend! HUGS to YOU!!! I particularly like the gold dabber frame and all the fine details. Congratulations on the designer spot in CS! I love your LO’s and I am so happy that I found your blog on the CS website! Congrats again on your DT gig! Beautiful LO my friend. Congrats on the DT for CS. I’ll be watching for it.I love the story behind the tree and ornaments too. Kelly, congrats on the Design Team post with the magazine. Well deserved. You will do amazing work for them, no doubt. I love love love your Christmas page. You are the master of detail! Love all the layers and shine. Just gorgeous. Congratulations, Kelly, on the GDT spot! This is great news! Love your layout and thank you for sharing your tutorial! Congrats! Wow, Kelly, this is such a cool blog. Love your sense of humor and writing style. Had a blast around here! BTW, great LO! Precious tips all over! Hi Kelly, congrats… I wonder what took someone so long to nab you!!! Your layout is beautiful and thanks for the little tutorial on it, I need all the help I can get! Your hubby sounds like a great guy… I got the other great guy… guess that makes us pretty great gals! Haven’t been around much lately but hope that changes soon! Have a great Thanksgiving and enjoy your family! Big congrats Kelly,that´s awesome!! Your layout is fabulous! Wow! I took the G45 Christmas Cards with you and am now a big fan! I love the paint around the photo! Wow Kelly, this layout is even more gorgeous up close! Love how you created the lamp post and the metal work on it! Your details are amazing! !